Pope Francis greets the Grand Imam of Al-Azhar in the Vatican on 16 October 2018. Read more in the September 2018 edition of ONE. Check out more in our magazine. And watch the video below, in which Msgr. Kozar shares more of the ways in which CNEWA helps spread the joy of the Gospel to so many who are on the margins. As the world prepares to mark the canonization of Pope Paul VI this weekend, we are reminded of his remarkable legacy — and how a significant part of that touches the people and places we serve, most notably in the Holy Land. There, an extraordinary event occurred in January of 1964. Pope Paul VI became the first Bishop of Rome, the pope, to visit the Holy Land since St. Peter left it almost 2,000 earlier. That alone would have been enough to make history. However, Paul VI was committed to the spirit of Vatican II, which included a call for the Catholic Church to be ecumenical. So, while in the Holy Land, the pope met with Athenagoras, the Greek Orthodox Patriarch of Constantinople. The significance of this cannot be overstated: this marked the first time a pope had met with the patriarch since the Great Schism of 16 July 1054, when the legate of Pope Leo IX announced the excommunication of Patriarch Michael I Cerularius — who, in turn, then excommunicated the pope. Despite efforts over the centuries, the break between the Catholic and Orthodox Churches showed few signs of healing. Thus the meeting of the Pope of Rome and the Patriarch of Constantinople was by any and every measure historic. However, the Paul VI’s visit to the Holy Land was not merely an opportunity to meet with the patriarch. It was also an opportunity for him to meet the people of the land—Israelis and Palestinians. Popes had historically shown concern for the Palestinian people through the establishment of the Pontifical Mission for Palestine by Pope Pius XII in 1949, which is presently the operating agency for CNEWA in the Middle East. Paul VI was no exception. Even before the 1967 War and the occupation of the West Bank by the Israelis Pope Paul VI saw that the situation of Palestinians was dire. Palestinians were leaving the Holy Land — and Christian Palestinians, often more educated than the general population, were emigrating in alarming numbers. After 1967, the situation became and has remained worse. In an effort to improve the situation of Palestinians, Pope Paul VI suggested opening some kind of educational facility. The schools of the Latin Patriarchate were always in need of teachers and so originally the idea was for an institute to train teachers. However, in 1973 Brother John Manual, FSC, suggested a university—the first of its kind on the West Bank. Brother Manual’s community, the Christian Brothers of De La Salle, had been active in education in the Holy Land for decades. The community offered property which they owned in Bethlehem for the new project. Like the other schools the brothers ran in the Middle East, the new university would be built on “La Sallian” principles of education and ethics, providing higher education opportunities for Palestinians. The university opened in 1973 with three religious brothers, some Palestinian faculty members and 112 students. Over the decades, Bethlehem University has become one of the premier universities in the region. With the goal of providing not only education but also employment opportunities to its students, the university over the years has added schools of nursing, business, education and an Institute for Hotel Management and Tourism — critical for handling the vast numbers of pilgrims who visit the region from around the world. The university now has more than 15,000 alumni and an enrollment of over 3,200 students. As the Christian population continues to diminish, Bethlehem University continues to serve all Palestinians—Christian and Muslim. By having Christian and Muslim students study together and get to know each other, the university is promoting a pluralistic culture of friendship and cooperation between Christians and Muslims in Palestine. CNEWA has been intimately connected with Bethlehem University over the decades. The Pontifical Mission for Palestine is engaged with the university and the president of CNEWA sits on the university’s board of directors. Bethlehem University refers to its students and alumni as “the bright stars of Bethlehem.” One can hope that those “stars of Bethlehem” can lead the Palestinian people to a new and brighter future. That is certainly what Pope Paul VI — soon to be St. Pope Paul VI — would have wished. 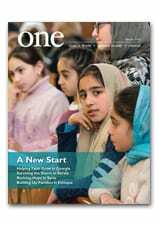 Read more about The Perseverance of Bethlehem University in the November 2004 edition of ONE magazine.